Starring Zizi Strallen as ‘Mary Poppins’ and Matt Lee as ‘Bert’, Neil Roberts as ‘George Banks’; Rebecca Lock as ‘Winifred Banks’; Penelope Woodman as ‘Miss Andrew’; Wendy Ferguson as ‘Mrs Brill’; Grainne Renihan as ‘Bird Woman’ and Blair Anderson as ‘Robertson Ay’. They are joined by Yves Adang; Abby Bebbington; Greg Bernstein; Jabari Braham; Matthew Caputo; Sophie Caton; Jennifer Davison; Lisa Dent; Joe Dockree; Maria Garrett; Hannah Grace; Graham Hoadly; Thomas-Lee Kidd; Antony Lawrence; Adam Margilewski; Anu Ogunmefun; Ben Oliver; Claire Parrish; Edwin Ray; Jo Lucy Rackham; Adam Rhys-Charles; Sam Salter; John Stacey; Christine Tucker; Alexandra Waite-Roberts; Wreh-Asha Walton and Scott Waugh. Zizi Strallen most recently starred as ‘Lana’ in Matthew Bourne’s The Car Man. Her previous West End credits include: Cats; the multi award-winning Merrily We Roll Along; Rock of Ages; Dirty Dancing; Chitty Chitty Bang Bang and Matthew Bourne’s Cinderella at Sadler’s Wells. She has also appeared in The Music Man at Chichester Festival Theatre and as ‘Penny Pingleton’ in Hairspray at Leicester Curve. Matt Lee, one of Australia’s premier “song and dance men”, played the role of ‘Bert’ in Mary Poppins in the hugely successful Australian production of the show, his portrayal winning him the prestigious Helpmann Award for Best Actor in a Musical. His other theatre credits in Australia include Miss Saigon, The Witches of Eastwick, Rent, Grease and The Boy from Oz. Matt was also a permanent member of the judging panel for Australia’s So You Think You Can Dance. Neil Roberts most recently appeared as Harry in Mamma Mia! at both the Prince of Wales and Novello Theatres in the West End. His other theatre credits include Love for Love and The Prisoners of War at Hampstead Theatre and The Jungle Book at the Other Place, Stratford-Upon-Avon. His many TV credits include ‘Mike Leydon’ in Coronation Street, ‘DS Jason Wise’ in Emmerdale and ‘Richard’ in Disney’s Life Bites. Rebecca Lock has most recently appeared as ‘Rosie’ in Mamma Mia! at the Novello Theatre. Her other theatre credits include Oliver! at Sheffield Crucible; The Tempest at Theatre Royal Bath; The Phantom of The Opera at Her Majesty’s Theatre and Avenue Q at the Noel Coward Theatre. Penelope Woodman’s recent theatre credits include: Sons of the Desert at the Royal Court Theatre Liverpool; the UK tour of Birds of a Feather; Mamma Mia! both at the Prince of Wales Theatre and on international tour, and the UK tour of Never Forget. Wendy Ferguson most recently played the role of ‘Madame Thenardier’ in Les Misérables at the Queens Theatre. Her other theatre credits include: ‘Carlotta’ in The Phantom of The Opera both at Her Majesty’s Theatre and at the 25th Anniversary Concert at the Royal Albert Hall, and ‘Widow Corney’ in Oliver! at Theatre Royal Drury Lane. Grainne Renihan’s theatre credits include: ‘Grizabella’ in Cats on UK Tour and in Hamburg; ‘Fantine’ in Les Misérables at the Palace Theatre; ‘Florence’ in Chess at the Prince Edward Theatre; ‘Guilietta’ in Aspects of Love at the Prince of Wales Theatre; ‘Ellen’ in Miss Saigon at the Theatre Royal Drury Lane and ‘Mary Magdalene’ in the European tour of Jesus Christ Superstar. Blair Anderson’s recent theatre credits include If the Lights Are Too Bright at the Ovalhouse Theatre; In Lambeth at the Southwark Playhouse, the Singapore tour of Seussical and the UK tour of Blockbuster The Musical. The internationally renowned and multi award-winning creative team assembled for MARY POPPINS is led by stage and film director Richard Eyre. Co-direction and Choreography is by Matthew Bourne, with Co-choreography by Stephen Mear. Set and Costume Design is by Bob Crowley with Lighting Design by Natasha Katz, Sound Design by Paul Groothuis and Orchestrations by William David Brohn. 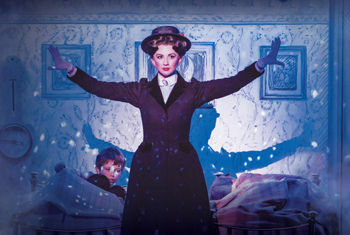 The International Tour of MARY POPPINS is Directed by James Powell with Original Choreography adapted by Geoffrey Garratt. Musical Supervision is by Stephen Brooker. The stage production of MARY POPPINS originally opened in 2004 and ran in the West End for three years and over 1,250 performances. During this time it won the Olivier Award for Best Theatre Choreography and Best Set Design as well as the Evening Standard Award for Best Set Design and the Variety Club Award for Best Musical. The Broadway production ran for over six years where it won the Tony Award for Best Set Design. The show has subsequently played to great success in Holland and Mexico. It has toured Australia, New Zealand, the U.S, the UK, has been seen by over 11 million people and is currently breaking box office records in Vienna.